This article is about the element. For other uses, see Antimony (disambiguation). Antimony is a chemical element with symbol Sb (from Latin: stibium) and atomic number 51. A lustrous gray metalloid, it is found in nature mainly as the sulfide mineral stibnite (Sb2S3). Antimony compounds have been known since ancient times and were powdered for use as medicine and cosmetics, often known by the Arabic name, kohl. 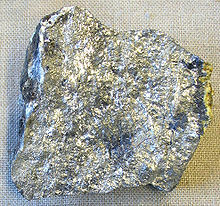 Metallic antimony was also known, but it was erroneously identified as lead upon its discovery. The earliest known description of the metal in the West was written in 1540 by Vannoccio Biringuccio. The largest applications for metallic antimony is an alloy with lead and tin and the lead antimony plates in lead–acid batteries. Alloys of lead and tin with antimony have improved properties for solders, bullets, and plain bearings. Antimony compounds are prominent additives for chlorine and bromine-containing fire retardants found in many commercial and domestic products. An emerging application is the use of antimony in microelectronics. Antimony is a silvery, lustrous gray metalloid with a Mohs scale hardness of 3, which is too soft to make hard objects; coins of antimony were issued in China's Guizhou province in 1931 but the durability was poor and the minting was soon discontinued. Antimony is resistant to attack by acids. 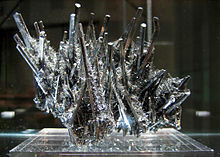 Four allotropes of antimony are known: a stable metallic form and three metastable forms (explosive, black and yellow). Elemental antimony is a brittle, silver-white shiny metalloid. 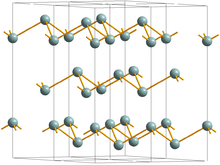 When slowly cooled, molten antimony crystallizes in a trigonal cell, isomorphic with the gray allotrope of arsenic. A rare explosive form of antimony can be formed from the electrolysis of antimony trichloride. When scratched with a sharp implement, an exothermic reaction occurs and white fumes are given off as metallic antimony forms; when rubbed with a pestle in a mortar, a strong detonation occurs. Black antimony is formed upon rapid cooling of antimony vapor. It has the same crystal structure as red phosphorus and black arsenic, it oxidizes in air and may ignite spontaneously. At 100 °C, it gradually transforms into the stable form. The yellow allotrope of antimony is the most unstable. It has only been generated by oxidation of stibine (SbH3) at −90 °C. Above this temperature and in ambient light, this metastable allotrope transforms into the more stable black allotrope. The abundance of antimony in the Earth's crust is estimated to be 0.2 to 0.5 parts per million, comparable to thallium at 0.5 parts per million and silver at 0.07 ppm. Even though this element is not abundant, it is found in more than 100 mineral species. Antimony is sometimes found natively (e.g. on Antimony Peak), but more frequently it is found in the sulfide stibnite (Sb2S3) which is the predominant ore mineral. 3 are all molecular compounds having trigonal pyramidal molecular geometry. 5 is a powerful Lewis acid used to make the superacid fluoroantimonic acid ("H2SbF7"). salts with hydride reagents such as sodium borohydride. Stibine decomposes spontaneously at room temperature. Because stibine has a positive heat of formation, it is thermodynamically unstable and thus antimony does not react with hydrogen directly. The Roman scholar Pliny the Elder described several ways of preparing antimony sulfide for medical purposes in his treatise Natural History. Pliny the Elder also made a distinction between "male" and "female" forms of antimony; the male form is probably the sulfide, while the female form, which is superior, heavier, and less friable, has been suspected to be native metallic antimony. The Greek naturalist Pedanius Dioscorides mentioned that antimony sulfide could be roasted by heating by a current of air. It is thought that this produced metallic antimony. The Italian metallurgist Vannoccio Biringuccio produced the first known description of a procedure to isolate antimony. With the advent of challenges to phlogiston theory, it was recognized that antimony is an element forming sulfides, oxides, and other compounds, as do other metals. The first discovery of naturally occurring pure antimony in the Earth's crust was described by the Swedish scientist and local mine district engineer Anton von Swab in 1783; the type-sample was collected from the Sala Silver Mine in the Bergslagen mining district of Sala, Västmanland, Sweden. 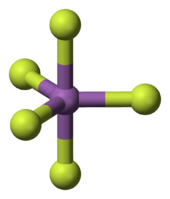 The medieval Latin form, from which the modern languages and late Byzantine Greek take their names for antimony, is antimonium. The origin of this is uncertain; all suggestions have some difficulty either of form or interpretation. The popular etymology, from ἀντίμοναχός anti-monachos or French antimoine, still has adherents; this would mean "monk-killer", and is explained by many early alchemists being monks, and antimony being poisonous. The standard chemical symbol for antimony (Sb) is credited to Jöns Jakob Berzelius, who derived the abbreviation from stibium. In 2016, according to the US Geological Survey, China accounted for 76.9% of total antimony production, followed in second place by Russia with 6.9% and Tajikistan with 6.2%. Antimony has consistently been ranked high in European and US risk lists concerning criticality of the element indicating the relative risk to the supply of chemical elements or element groups required to maintain the current economy and lifestyle. About 60% of antimony is consumed in flame retardants, and 20% is used in alloys for batteries, plain bearings, and solders. Antimony is mainly used as the trioxide for flame-proofing compounds, always in combination with halogenated flame retardants except in halogen-containing polymers. The flame retarding effect of antimony trioxide is produced by the formation of halogenated antimony compounds, which react with hydrogen atoms, and probably also with oxygen atoms and OH radicals, thus inhibiting fire. Markets for these flame-retardants include children's clothing, toys, aircraft, and automobile seat covers. They are also added to polyester resins in fiberglass composites for such items as light aircraft engine covers. The resin will burn in the presence of an externally generated flame, but will extinguish when the external flame is removed. Antimony forms a highly useful alloy with lead, increasing its hardness and mechanical strength. For most applications involving lead, varying amounts of antimony are used as alloying metal. In lead–acid batteries, this addition improves plate strength and charging characteristics. It is used in antifriction alloys (such as Babbitt metal), in bullets and lead shot, electrical cable sheathing, type metal (for example, for linotype printing machines), solder (some "lead-free" solders contain 5% Sb), in pewter, and in hardening alloys with low tin content in the manufacturing of organ pipes. Three other applications consume nearly all the rest of the world's supply. One application is as a stabilizer and catalyst for the production of polyethylene terephthalate. Another is as a fining agent to remove microscopic bubbles in glass, mostly for TV screens; antimony ions interact with oxygen, suppressing the tendency of the latter to form bubbles. The third application is pigments. Antimony is increasingly being used in semiconductors as a dopant in n-type silicon wafers for diodes, infrared detectors, and Hall-effect devices. In the 1950s, the emitters and collectors of n-p-n alloy junction transistors were doped with tiny beads of a lead-antimony alloy. Indium antimonide is used as a material for mid-infrared detectors. Biology and medicine have few uses for antimony. Treatments containing antimony, known as antimonials, are used as emetics. Antimony compounds are used as antiprotozoan drugs. Potassium antimonyl tartrate, or tartar emetic, was once used as an anti-schistosomal drug from 1919 on. It was subsequently replaced by praziquantel. Antimony and its compounds are used in several veterinary preparations, such as anthiomaline and lithium antimony thiomalate, as a skin conditioner in ruminants. Antimony has a nourishing or conditioning effect on keratinized tissues in animals. Antimony-based drugs, such as meglumine antimoniate, are also considered the drugs of choice for treatment of leishmaniasis in domestic animals. Unfortunately, besides having low therapeutic indices, the drugs have minimal penetration of the bone marrow, where some of the Leishmania amastigotes reside, and curing the disease – especially the visceral form – is very difficult. Elemental antimony as an antimony pill was once used as a medicine. It could be reused by others after ingestion and elimination. Antimony(III) sulfide is used in the heads of some safety matches. 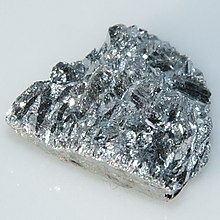 Antimony-124 is used together with beryllium in neutron sources; the gamma rays emitted by antimony-124 initiate the photodisintegration of beryllium. The emitted neutrons have an average energy of 24 keV. Natural antimony is used in startup neutron sources. ^ Already in 1710 Wilhelm Gottlob Freiherr von Leibniz, after careful inquiry, concluded the work was spurious, there was no monk named Basilius Valentinus, and the book's author was its ostensible editor, Johann Thölde (c. 1565 – c. 1624). Professional historians now agree the Currus Triumphalis ... was written after the middle of the 16th century and Thölde was likely its author. ^ David Kimhi's Commentary on Jeremiah 4:30 and I Chronicles 29:2; Hebrew: פוך/כְּחֻל, Aramaic: כּוּחְלִי/צדידא; Arabic: كحل, and which can also refer to antimony trisulfide. See also Z. Dori, Antimony and Henna (Heb. הפוך והכופר), Jerusalem 1983 (Hebrew). ^ "Metals Used in Coins and Medals". ukcoinpics.co.uk. ^ a b Wang, Chung Wu (1919). "The Chemistry of Antimony" (PDF). Antimony: Its History, Chemistry, Mineralogy, Geology, Metallurgy, Uses, Preparation, Analysis, Production and Valuation with Complete Bibliographies. London, United Kingdom: Charles Geiffin and Co. Ltd. pp. 6–33. ^ Norman, Nicholas C (1998). Chemistry of arsenic, antimony, and bismuth. pp. 50–51. ISBN 978-0-7514-0389-3. ^ a b c d "Mineral Commodity Summaries: Antimony" (PDF). United States Geological Survey. Retrieved 1 January 2016. ^ Reger, Daniel L.; Goode, Scott R. & Ball, David W. (2009). Chemistry: Principles and Practice (3rd ed.). Cengage Learning. p. 883. ISBN 978-0-534-42012-3. ^ a b House, James E. (2008). Inorganic chemistry. Academic Press. p. 502. ISBN 978-0-12-356786-4. ^ a b c d Moorey, P. R. S. (1994). Ancient Mesopotamian Materials and Industries: the Archaeological Evidence. New York: Clarendon Press. p. 241. ISBN 978-1-57506-042-2. ^ Pliny, Natural history, 33.33; W.H.S. Jones, the Loeb Classical Library translator, supplies a note suggesting the identifications. ^ s.v. "Basilius Valentinus." Harold Jantz was perhaps the only modern scholar to deny Thölde's authorship, but he too agrees the work dates from after 1550: see his catalogue of German Baroque literature. ^ Weeks, Mary Elvira (1932). "The discovery of the elements. II. Elements known to the alchemists". Journal of Chemical Education. 9 (1): 11. Bibcode:1932JChEd...9...11W. doi:10.1021/ed009p11. ^ Klaproth, M. (1803). "XL. Extracts from the third volume of the analyses". Philosophical Magazine. Series 1. 17 (67): 230. doi:10.1080/14786440308676406. ^ a b Harper, Douglas. "antimony". Online Etymology Dictionary. ^ In his long article on chemical reactions and nomenclature – Jöns Jacob Berzelius, "Essay on the cause of chemical proportions, and on some circumstances relating to them: together with a short and easy method of expressing them," Annals of Philosophy, vol. 2, pages 443–454 (1813) and vol. 3, pages 51–62, 93–106, 244–255, 353–364 (1814) – on page 52, Berzelius lists the symbol for antimony as "St"; however, starting on page 248, Berzelius subsequently uses the symbol "Sb" for antimony. ^ "United States Geological Mineral Commodity Summary" (PDF). ^ "Environmental Protection Law of the People's Republic of China" (PDF). 24 April 2014. ^ "U.S. Geological Survey, Mineral Commodity Summaries: Antimony" (PDF). 1 January 2016. ^ "Study of the antimony market by Roskill Consulting Group" (PDF). Archived from the original (PDF) on 18 October 2012. Retrieved 9 April 2012. ^ a b c d e f g Butterman, C.; Carlin, Jr., J. F. (2003). "Mineral Commodity Profiles: Antimony" (PDF). United States Geological Survey. ^ a b Norman, Nicholas C (1998). Chemistry of arsenic, antimony, and bismuth. p. 45. ISBN 978-0-7514-0389-3. ^ "MineralsUK Risk List 2015". ^ "Review of the list of critical raw materials for the EU and the implementation of the Raw Materials Initiative". ^ "American Resources Policy Network Report" (PDF). ^ Weil, Edward D.; Levchik, Sergei V. (4 June 2009). "Antimony trioxide and Related Compounds". Flame retardants for plastics and textiles: Practical applications. ISBN 978-3-446-41652-9. ^ Weil, Edward D.; Levchik, Sergei V. (4 June 2009). Flame retardants for plastics and textiles: Practical applications. pp. 15–16. ISBN 978-3-446-41652-9. ^ Kiehne, Heinz Albert (2003). "Types of Alloys". Battery Technology Handbook. CRC Press. pp. 60–61. ISBN 978-0-8247-4249-2. ^ Holmyard, E. J. (2008). Inorganic Chemistry – A Textbook for Colleges and Schools. Read Books. pp. 399–400. ISBN 978-1-4437-2253-7. ^ Yamashita, H.; Yamaguchi, S.; Nishimura, R.; Maekawa, T. (2001). "Voltammetric Studies of Antimony Ions in Soda-lime-silica Glass Melts up to 1873 K" (PDF). Analytical Sciences. 17 (1): 45–50. doi:10.2116/analsci.17.45. PMID 11993676. ^ O'Mara, William C.; Herring, Robert B.; Hunt, Lee Philip (1990). Handbook of semiconductor silicon technology. William Andrew. p. 473. ISBN 978-0-8155-1237-0. ^ Maiti, C. K. (2008). Selected Works of Professor Herbert Kroemer. World Scientific, 2008. p. 101. ISBN 978-981-270-901-1. ^ Committee On New Sensor Technologies: Materials And Applications, National Research Council (U.S.) (1995). Expanding the vision of sensor materials. p. 68. ISBN 978-0-309-05175-0. ^ Kinch, Michael A (2007). Fundamentals of infrared detector materials. p. 35. ISBN 978-0-8194-6731-7. ^ Willardson, Robert K & Beer, Albert C (1970). Infrared detectors. p. 15. ISBN 978-0-12-752105-3. ^ Russell, Colin A. (2000). "Antimony's Curious History". Notes and Records of the Royal Society of London. 54 (1): 115–116. doi:10.1098/rsnr.2000.0101. JSTOR 532063. PMC 1064207. ^ Kassirsky, I. A.; Plotnikov, N. N. (1 August 2003). Diseases of Warm Lands: A Clinical Manual. pp. 262–265. ISBN 978-1-4102-0789-0. ^ Organisation Mondiale de la Santé (1995). Drugs used in parasitic diseases. pp. 19–21. ISBN 978-92-4-140104-3. ^ National Research Council (1970). Trends in usage of antimony: report. National Academies. p. 50. ^ Stellman, Jeanne Mager (1998). Encyclopaedia of Occupational Health and Safety: Chemical, industries and occupations. p. 109. ISBN 978-92-2-109816-4. ^ Ahmed, Syed Naeem (2007). Physics and engineering of radiation detection. p. 51. ISBN 978-0-12-045581-2. ^ a b c d NIOSH Pocket Guide to Chemical Hazards. "#0036". National Institute for Occupational Safety and Health (NIOSH). ^ Guidelines for Drinking-water Quality (PDF) (4th ed.). World Health Organization. 2011. p. 314. ISBN 978-92-4-154815-1. ^ "Antimony poisoning". Encyclopedia Britannica. ^ Sundar, S; Chakravarty, J (2010). "Antimony Toxicity". International Journal of Environmental Research and Public Health. 7 (12): 4267–4277. doi:10.3390/ijerph7124267. PMC 3037053. PMID 21318007.